It has only been five days since the last game, and in those five days a lot has changed for the Villanova Wildcats. There was a new team on the floor tonight. Everything meshed together for the Wildcats, the sloppy play during the Lafayette game was left behind when the final buzzer sounded. Villanova won in convincing fashion, winning 90-59 in a 31-point blowout effort. Mount St. Mary’s was leading 8-7 until Villanova kicked it into high gear. Villanova capped off a 16-0 run with 11:24 remaining in the first half. They were much more efficient with the ball, relying mainly on driving the ball inside and scoring. Villanova had a whopping 60 points from inside the paint. Excellent ball movement by Villanova on offense. Tony Chennault had a team high six assists, and did a great job managing the floor. One assist ended in a backwards alley-oop for James Bell that got the crowd going wild. The Wildcats never looked back, leading 46-25 at the half. The beatdown continued for the rest of the game, the high pressure Mount St. Mary’s defense was dismantled. In a game that included 17 fastbreak points and 20 points off of turnovers for Villanova, the offensive front was unstoppable. All Villanova players got play time, including the bench mob. Nick McMahon came in with 3:24 left in the game. Henry Lowe and Patrick Farrell checked in with 1:58 remaining. Lowe scored his first basket of his collegiate career, sending the crowd into a frenzy. JayVaughn Pinkston was the high scorer of the night, finishing with 21 points. 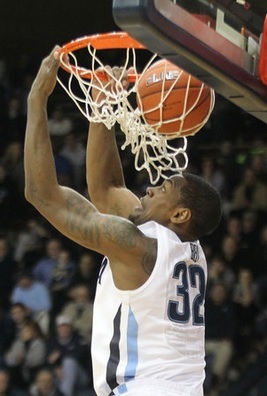 Pinkston bullied the Mountaineers inside, showing great skill finishing around the rim. Darrun Hilliard had 18 points. James Bell contributed 12 points and 8 rebounds. Aside from these great performances, the spotlight goes to freshman Josh Hart. Hart had the first double-double of the season and of his career, scoring 17 points and grabbing 11 rebounds. He was also efficient, shooting 7 for 8. The Villanova defense was suffocating, holding the Mountaineers to a 29.8 shooting percentage. This is only less than half of what the Wildcats were able to accomplish (62.7 shooting percentage) As a three-point shooting team, the Mountaineers struggled, shooting under 30 percent from long range. Julian Norfleet led the Mountaineers in scoring for the second straight game, putting up 15 points. The duo of Sam Prescott and Rashad Whack was held to shooting 6 for 23, scoring 13 and 10 points, respectively. The Wildcats will play again on Sunday, November 17, when they host the Towson Tigers. Tip-off is at 5 p.m.